CHARLOTTE, N.C. -- Darrell "Bubba" Wallace Jr. was stressed. "Not sleeping, not eating, not being my normal self, just because it was always, 'what in the heck am I going to do?'" Wallace said Wednesday during the NASCAR Media Tour hosted by Charlotte Motor Speedway. The "what" ended up being the opportunity of a lifetime for the 24-year-old Alabama native. After losing his full-time NASCAR Xfinity Series ride with Roush Fenway Racing due to a lack of sponsorship, Wallace's future in the sport was in doubt. Wallace then caught a break of sorts; he was called upon to drive Richard Petty Motorsports' No. 43 in the Monster Energy NASCAR Cup Series while Aric Almirola recovered from a back injury he suffered at Kansas Speedway in May. "Yeah, going into those four races last year, it was like, 'OK, this isn't my car, this isn't my ride, no need to throw that extra little bit out there,'" Wallace said. "Let's just get through and we ended up having some of the best races." Wallace improved weekly during his four-week relief duty, going from a 26th at Pocono to coming home in 11th at Kentucky Speedway. In the midst of that run, Wallace's stock jumped even more after winning the Camping World Truck Series race at Michigan. When Almirola and sponsor Smithfield announced their departure from RPM before the conclusion of last season, many in the NASCAR world felt Wallace had proven enough to justify getting the ride. In October, the team made it official, naming Wallace the full-time driver of the No. 43 Chevrolet in 2018. Although his team only has sponsorship confirmed for 13 races at this point, Wallace said there's no doubt they'll be at the track every week. "We're running the full season, I know that for sure," he said. "That was one of the selling points of signing that contract, to make sure we're running the full season. We don't know about the other races, who's going to be the car. Some races (you) might see my pretty face on the hood on that thing. "The economy has changed so much over the last couple years, and it's hard to get that multi-million dollar sponsorship. I'm trying to do everything under the sun to land that, whether it's going to the meeting, making the phone calls, going out to LA, doing fun stuff like Nickelodeon and creating those new relationships and partnerships and becoming brand ambassadors of certain outlets. I'm trying to do all that to sell myself." 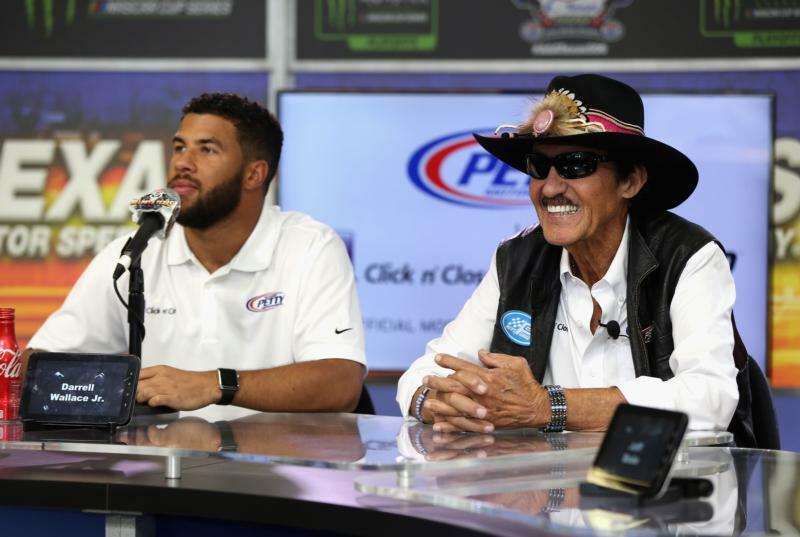 Wallace, who owns six victories in the NASCAR Camping World Truck Series, said driving for Richard Petty is an experience unlike any other. "Working with the King is special. I've worked with a lot of cool bosses and owners, and there's no one like Richard Petty. "I mean, he has just this aura around him. When he walks in the room, it's like, 'that's Richard Petty right there,' and you still get starstruck...He wants to see the 43 back to its winning ways. He wants it to be a more competitive car, and at the same time, we all know realistically that it's going to take a little bit." Among the changes for the 43 team this year are a new manufacturer, a technical alliance with Richard Childress Racing, and a new shop located on the RCR campus in Welcome, North Carolina. But that doesn't faze Wallace in the slightest. "For me to share a little bit of his history and his past and all of his accomplishments, in my rookie season, who would have ever thought this story would happen? I'm just looking at it as don't mess up, don't be a hero, like he told me before climbing in the car at Pocono," Wallace shared. "There's no need to be a hero, just go out there and do what I can do." And if things don't go exactly as planned, don't expect Wallace to fall back into the rut he was in last year. "Life is tough. It'll chew you up and spit you out in a heartbeat, and you have to be ready for it, and I wasn't ready for it at the time. If this ever happens again, then I'll try not to get as stressed, but I'll just have to go out and win another race, I guess."